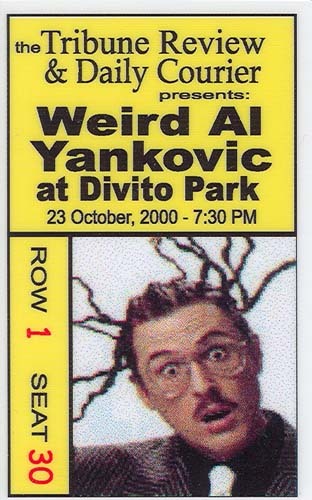 A very unique ticket for Al's October 23, 2000 concert in Leisenring, PA. Not only was the show on Al's birthday, but this was also the infamous show at the "roller rink in the middle of nowhere." The birthday "prank," if one can call it that, was that Al's stool was missing from "The Saga Begins," though there was a quick keyboard rendition of "Happy Birthday to You" before going into "Yoda." A couple of numbers from the second half of the setlist were cut, clearly an indication that Al and the guys wanted to get the heck out of there. The teenage boy who ran up onto the stage at the end of "Yoda," only to be literally tackled by Mongo, no doubt sealed the deal.